Dubai, UAE, December 06, 2018: Discreet, elegant or provocative, the new Baroncelli Lady Day & Night is designed to complement every form of female audacity. Whether working, shopping or at a party, its three easily interchangeable straps can be adapted to any occasion. The Baroncelli Lady Day & Night offers three different styles in a single watch, with semi-matt black leather, glossy lacquered red leather or grey satin-look fabric. Its perfectly round steel case reveals a magnificent white mother-of-pearl dial surrounded by a grained white flange. Echoing this shimmering centre, three diamonds are placed at 3, 9 and 12 o’clock to give this rare model extraordinary radiance. These refined aesthetics conceal the Caliber 80, a next-generation automatic movement which offers up to 80 hours of power reserve. Its exceptional autonomy frees the mind from worrying about the passing time. With its delicate design and gentle curves, the Baroncelli Lady Day & Night becomes a constant companion on the wrist, both day and night. 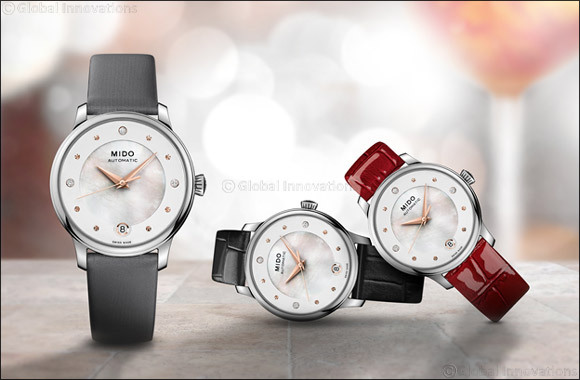 The MIDO Baroncelli Lady Day & Night collection priced at AED 3,700 and is available across Hour Choice stores in the UAE.